I’m at Shift Happens – not far to travel to this event – it’s at the Theatre Royal in York just three minutes walk from my house. Each of the two days is packed with speakers in the main theatre and surrounded by smaller events, performances and engaging demonstrations. Even food is provided. 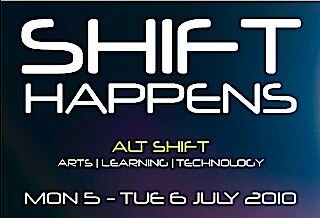 Lots of time for networking, there’s an avalanche of tweeting #shifthappens and hot on the heels of DS5 in Aberystwyth it’s good to be inspired again in another area of the arts. This time mainly theatre. Sadly I missed the Keynote speech from Sir Ken Robinson because I had to rush away to a board meeting of Riding Lights Theatre Company where I’m a trustee. I hope to be able to catch up on his presentation. He was live from San Francisco via Skype. Please say someone recorded it. The day’s events were adequately covered by Colm, of KhaozMediaYork, who is blogging from the event.